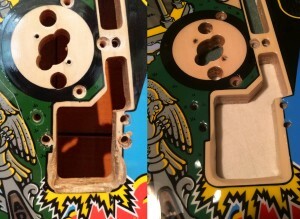 How do you get a playfield with serious wear looking good as new? It takes skill, patience and a lot of artistic wizardry. Find out more about this weird science and see the results of Pavlov Pinball’s Addams Family playfield restoration at Pinball Dreams in our exclusive restoration feature.